With the IVA® Model 210s Internal Vapor Analyzer, you can perform package moisture and gas analysis, on-site at your facility. This is a user-friendly test system for monitoring the quality of your hermetic packaging processes. IVA® technology was invented by ORS and offers the most accurate and reproducible data in the industry. Find out about having us conduct your tests in our lab. 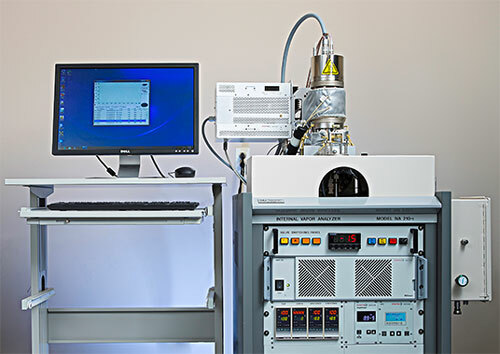 The IVA® system is specifically designed for the quantitative analysis of low molecular weight gases contained in hermetic packages, cavities and other enclosures. The Model 210s concept integrates automated hardware with easy-to-use icon-driven software. Its design permits routine quality control, failure analysis and research level testing operation as a turn-key analytical system. The IVA® Model 210s includes a high-performance, quadrupole-mass spectrometer analyzer, a sample-mounting interface and precision hardware. The instrument is also computer-controlled and equipped with exclusive ORS integrated system control software — which provides instrument control, data analysis, data archiving and ease of operation. Our IVA® system offers the most accurate and reproducible data in the industry. Let us show you how easy it is! Systems are custom built to order. If you have a unique application for hermetic gas analysis, please give us a call at 1 (855) ORS-LABS. We will design a system and develop test protocols to meet your specific application.